Every charpoy we make is unique. 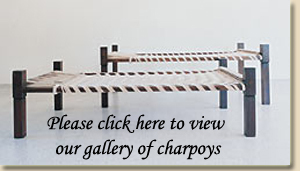 Our charpoys are handmade. The process begins with the careful selection of choice hardwood timbers which must be well seasoned and of handsome and uniform grain. We are always keen to use recycled timber and will only accept certified wood from reputable mills. The joiners then proceed to build the frames paying special attention to the dimensions and the mortice and tenon joints (no nails or screws are used). The frames are now ready to be finished to the customer’s needs. Typically this involves applying a wood stain followed by four or more coats of varnish. This process is carefully checked at each step to ensure a top class finish on all our charpoys. At last the stringers are now ready to weave their magic. This process starts with what we call the knurled crossband, followed by the main weave and finally the tension strings are added. 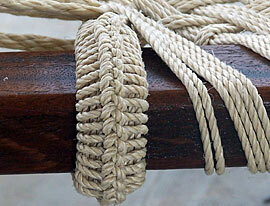 The final process of tightening is rigorous and repeated many times in order to get tension just right. The cord we use is polypropylene and is specially made for Stringbedco. It looks and feels very natural. The charpoys are then stamped with an identity number and finally wrapped, ready for delivery. The Round Legs range. Starting from left, clockwise, Raj, Luxman, Maya ,Piri, Ashoka. Tabled below are details of our standard range of charpoys. Orders can be customized to suit your requirements . 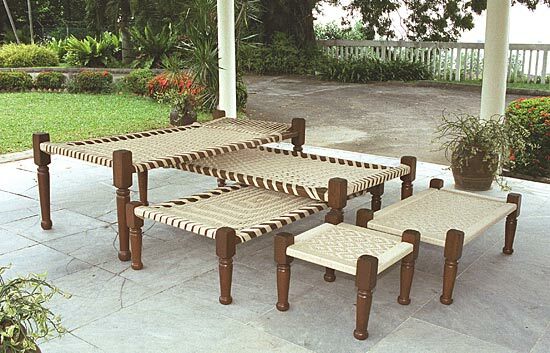 To view samples of weaves and legs, click here.